Have been looking for pan and tilt IP security cameras online for hours but going in circles? Check the below useful pan and tilt IP security cameras (systems) buying guide, and you will get all information you need. What is a pan tilt (zoom) IP network security camera? What PTZ web camera functions are? Pan tilt IP cameras can help you monitor multiple positions, while fixed IP security cameras can only point at a specific area. When you want to view other positions of your property, you can simply use the PT control function on your software to scan your home and business, without moving the cameras physically. That’s one of the most important reasons why pan tilt IP cameras are developed. The price of IP security cameras with pan tilt function is generally higher than fixed types, since pan tilt IP video cameras offer you much more flexibility to monitor your property. The pan tilt IP camera price ranges $90–$300, which depends on the features and functions of the pan tilt IP surveillance cameras. 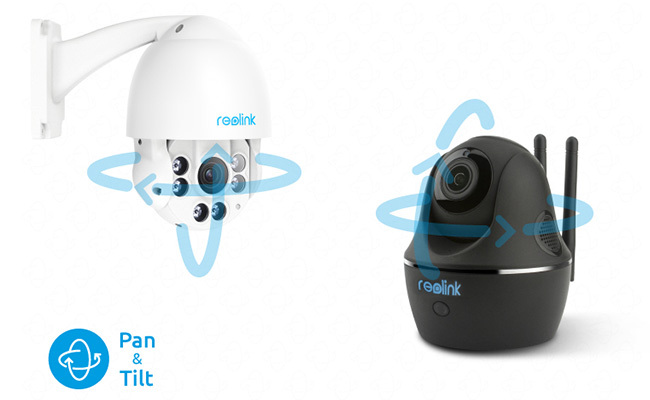 Most pan tilt IP security cameras typically include the dome camera type and the smart home security camera type (like Reolink C1 Pro). There are few bullet security cameras that support pan tilt function. When you rotate the bullet cameras (if they support the pan and tilt), the long rectangular body of the camera may hit the wall, which may damage the lens of the cameras. Dome pan tilt IP cameras & systems: This type of security cameras include wireless (WiFi) and PoE pan tilt security cameras. Both of them are extremely easy to install or mount. Smart home pan tilt IP security cameras: This type of security cameras are typically either wireless type or battery-powered type, and are often used as baby or pet monitors. In panning, the IP security camera moves horizontally to the left or right direction. 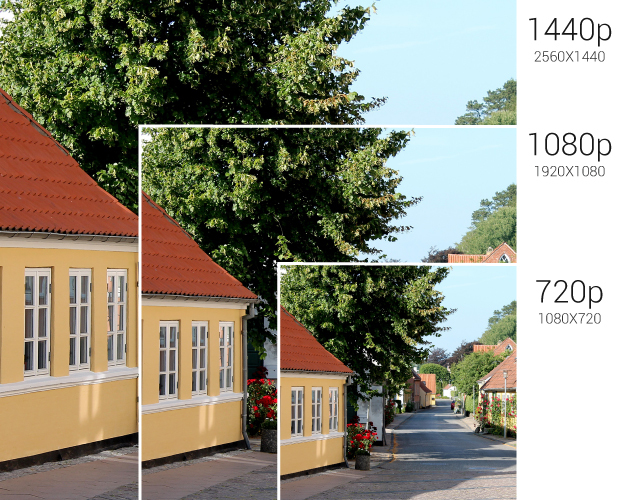 With the help of panning, you can look through your home and business horizontally. Tilting enables you to scan your property up and down (vertically). Some pan tilt home security cameras can offer you zoom function, which enable you to zoom in or out to view more image details or have a wider viewing angle without degrading the image quality. If you are interested in zoom security cameras, you can check this post to get full details. In pan tilt IP security cameras, you can enjoy preset and tour functions, which makes this kind of IP cameras different from normal fixed IP cameras. Position preset: By setting up several preset positions, you can see an area quickly and accurately only by selecting the required positions. This function helps you return the pan tilt IP surveillance cameras to the predetermined camera position to restart tracking even you lose track of the project. Tour or patrol: The guard tour function combines preset positions, the moving speed of pan tilt IP cameras and the duration at each preset potion. You can set up your pan tilt IP video cameras to do tours or patrol the predefined areas on autopilot. In a pan tilt IP camera, the angle and speed of pan and tilt really matter. With the advanced technology, some security camera manufacturers can develop 360-degree pan and 90-degree tilt IP cameras, which can rotate 360°. You can watch the below video to see the pan tilt in action of a high speed PTZ IP security camera (shared by a tech reviewer). The speed of pan tilt IP cameras varies among different pan tilt (zoom) IP cameras. Some pan tilt dome IP cameras can offer you 2.5° – 180°/s pan speed and 1.5° – 90°/s. You can set up the rotation speed based on your specific needs. Some high speed dome pan tilt IP cameras can offer you 240°/s pan speed and 200°/s tilt speed, which is really exceptional! You may see some pan tilt IP cameras with auto tracking. Auto tracking PT(Z) IP cameras can track moving objects with the built-in firmware program that monitor the change of pixels generated by the video clip. You can check the benefits of outdoor and indoor pan tilt IP cameras compared with fixed counterparts. Get preset potions so you can just monitor the areas you want. Patrol your property based on autopilot. When you buy wireless (WiFi) or PoE wired pan and tilt IP cameras, consider the below top 6 features, so you can buy the best one within minutes. Waterproof is indispensable when you install pan tilt IP network video cameras outdoors. IP66 pan tilt security cameras are good options when you need to monitor your garden, shed, garage and other outdoor environments. Outdoor waterproof wireless or wired pan and tilt IP cameras offer you no limited mounting or installation placement. You can install your PT(Z) IP security cameras outdoors or indoors, almost anywhere you like. When you set up a pan tilt security camera outside your home, you can check if there is someone approaching your property, or anything unusual outside your home, and decide what to act. Pan tilt (zoom) IP security cameras with night vision are a powerful tool in maintaining your property security in the dark. The night vision PT(Z) IP surveillance cameras utilize infrared LEDs to capture crystal clear images and videos, so you won’t miss anything important both day and night. 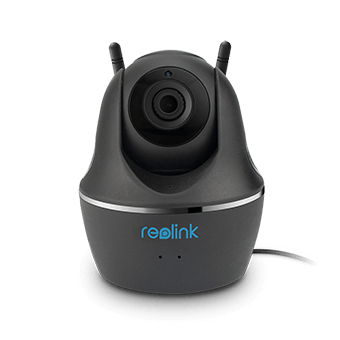 Reputable security camera companies, such as Reolink, will provide you extremely clear night vision images with almost no noise. 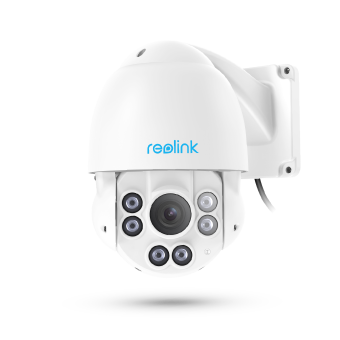 Take RLC-423 pan tilt zoom security camera as an example. The camera uses high-quality 1/3″ or 1/2.9″ CMOS sensors which offer you 190ft long night vision range. You can check the night vision quality of RLC-423 in the below video (shared by a tech YouTuber). Bump: You can reference our infrared night vision security cameras buying guide here to get more details on outdoor and indoor night vision IR pan tilt IP security cameras. Outdoor and indoor pan tilt HD megapixel IP security cameras enable you to view things very clearly. Clear images and videos can make a difference in catching criminals and letting them get away with your property. If there is a break-in happened to you, the clear footage captured by your HD PT(Z) IP security cameras would be the perfect recording evidence. For example, if you install a wireless or PoE 1080p Full HD PTZ IP camera with 12X/10X optical zoom, you can view a person’s face extremely clearly. With clear images, the police can help you catch the bad guy more easily. There are 3 popular options for your reference: 720p, 1080p Full HD and 1440p Super HD pan tilt IP security cameras. View the difference of 3 kinds of high definition security cameras here. The two-way audio in pan tilt IP cameras is necessary if you want to talk to your family in real time. For example, you can check whether your children have already got home after school. Besides, if you notice someone suspicious approaching your house, or having already invaded your property, you can shout at him or her, and scare the thief off. Pan tilt (zoom) wireless and PoE IP cameras with motion-activated function can send you real-time alerts when there is anything unusual. When there are any motion events detected by your pan tilt cameras mounted outdoors, you can receive app push notifications, so you can access your cameras to see who and what triggered the event, and decide how to respond. Besides, you will get FTP snapshots or short video clips and keep them as evidence. Some pan tilt security cameras will have built-in SD card, which enables you to get local storage when there are motion events. You can get video surveillance for your property even without Internet. Wanna access your pan tilt (zoom) IP cameras in real time no matter where you are? Then don’t forget to find a panning and tilting security camera with remote access. You can check everything happening to your home when you are in your office or travelling. You can see who is knocking on your door without getting up from the sofa. If you want to access multiple pan tilt WiFi and wired pan tilt (zoom) security cameras at the same time, always buy security cameras that have intuitive and powerful accompanying client and app. 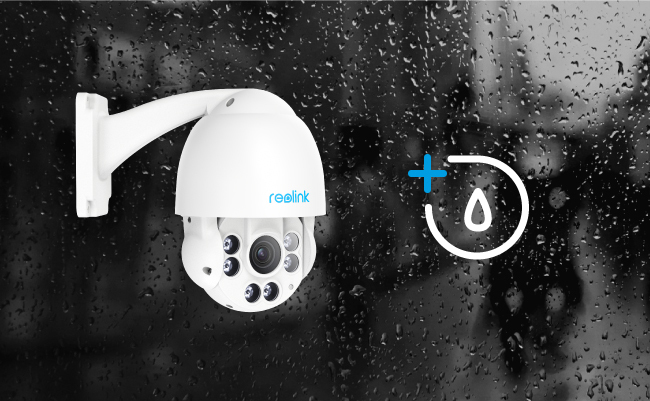 You can take a look at Reolink security camera software. You can get multiple-screen live streaming with your PC, Mac, iPhone or Android smartphones anytime. You can also play back the recorded videos. Another good point of Reolink software is that you can record videos manually with your smartphones. For example, when you check your lovely dog, kitty or bunny, you can record the “cute behavior” with your smartphones and share the videos with your friends. All the above features should be taken into consideration, when you want to buy the best outdoor and indoor pan and tilt (and zoom) wireless (WiFi) or PoE IP cameras. When buying high-quality pan tilt (zoom) IP security cameras that won’t break your bank, you can check the below best picks. It is a 1440p (4MP) Super pan tilt WiFi IP camera, which is much clearer than 2MP and 3MP counterparts. If you want to buy a decent indoor professional mini pan tilt IP camera, it’s definitely a nice option. Its 355° pan and 105° tilt almost cover every angle of your property indoors. You can take a look at the below video “Naughty Pet Caught in the Act” captured by Reolink C1 Pro (shared by a customer). It’s one of the best outdoor wired PoE remote pan tilt zoom dome IP cameras with excellent IR distance. It features 360° pan and 90° tilt, which can rotate 360° in high speed, leaving no blind spots. You can use your iPhone or Android smartphones as the PTZ controller to control this high speed dome PTZ IP camera. The IR distance of RLC-423 can reach up to 190 feet, so you can see everything extremely clearly even in the dark. If you want to buy a decent pan, tilt & zoom security camera that is under $300 or about $200, this camera suits your budget well. You can watch this video to see the beautiful scenery recorded by RLC-423 pan tilt zoom IP camera (share by a RLC-423 big fan). If one of the above pan tilt (zoom) security cameras can meet your requirements, congratulations and enjoy your new pan tilt IP security camera now! If not, you can head over to security camera online shop or Amazon and go shopping. Keep the above list of standard features handy and tick them off when you find them. Remember to note the bonus and potential drawbacks. Bear in mind that there are no 100% perfect pan tilt IP security cameras. As long as your pan tilt IP surveillance cameras honor yours, you’ve found the winner. Some of you may ask, “My 1080p cam won’t pan/tilt remotely, what should I do?” Well, if you have the same question, here are several ways to fix it. 1. Confirm that you’ve used the PT(Z) control button correctly. 2. Use the software that the pan tilt IP camera company provides to control the pan tilt function, since some of third-party software may not support the PT function. 3. Reset the camera and verify it is turning on and working. This entry was posted in Buyer's Guide and tagged benefits, Pan Tilt IP Cameras, patrol, wide coverage.